Alex Passapera will be traveling back to Vermont Custom Tattoo and Piercing for a Guest Spot. February 10th – the 23rd. So if you are interesting in getting new work, finishing old work, touch ups, consults, etc… This is the window of opportunity. 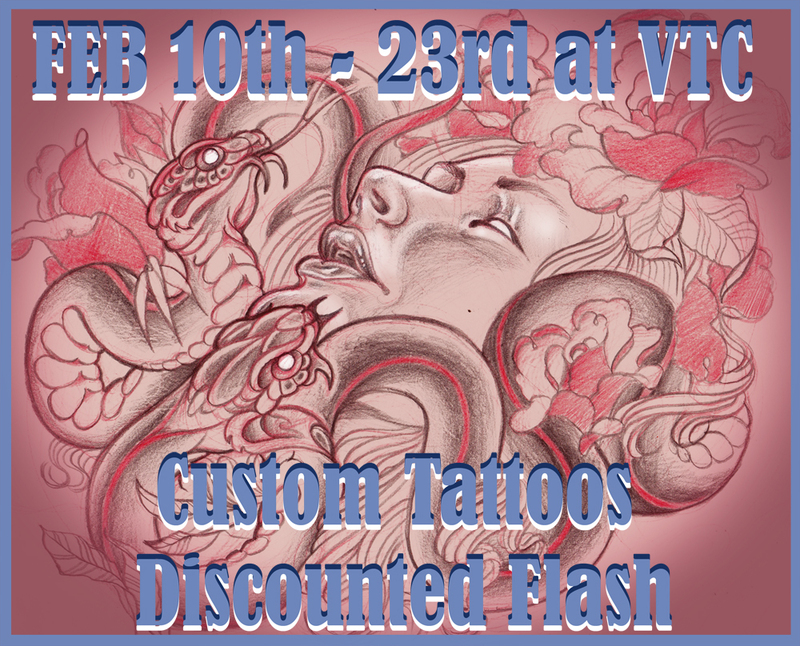 he will also have some discounted flash available for a limited supply… snakes and flowers and such. Funs stuff. I will have the flash at the shop for you to look through. They are not negotiable in size or colors, what you see is what you get, thus the discount. For those of you who didn’t know, Julie (Boss lady and head piercer) went on a little vaca. for some R&R. She is back now, burnt to a crisp and ready to take your piercing requests! Goodbye Sinz! We will miss you as well. Another artist from VC has left us again. Chasing the summer weather, Mr. Sinz has packed up, and escaped the impending winter weather, for Myrtle Beach. We will miss you Sir and the many wonderful things that made you an integral part of our tattooing family; your tastefully inappropriate jokes, both racist and sexist, the well timed bodily excretions in and around the shop, the high pitched sucking sounds of your attempts to dislodge food out of your bridge, the jovial rocking from toe to heel as you stood in front of the small flat screen in VC as you watched Food Network, completely entranced by how they glazed doughnuts and filled Boston Creams. And though we know you will be coming back frequently for guest spots and friendly visits, we can’t help think you will leave a hole in our hearts much to large to fill. We shall miss you. Goodbye Becca Blust, We miss you! Yes, the beloved and talented Becca Blust has left us for the open road. We wish her luck on all her adventures and hope she continues to practice her craft with much enthusiasm. You may follow the adventures of Becca, and her partner in crime – Andrew – at her weblog: BeccaBlust.com. Come back and visit us soon Becca, and make sure to send a post card. We love you. The Easiest Button To Button!